Kavanaugh has among the lowest support levels for a nominee since 1987. 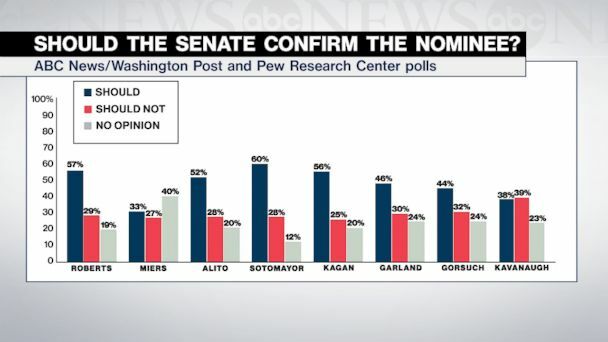 As his confirmation hearings begin, an ABC News/Washington Post poll finds the public evenly divided on Brett Kavanaugh’s nomination to the U.S. Supreme Court – among the lowest support levels for a high court nominee in polling back to 1987. Six in 10 Americans also say Kavanaugh should publicly state his position on abortion before being confirmed. And there’s a substantial shift from 2005 in views on how the court should deal with abortion access – fewer say it should make it harder to get an abortion, more say the court should make it easier. Thirty-eight percent of Americans say Kavanaugh should be confirmed, 39 percent not, with the rest undecided in this poll, produced for ABC by Langer Research Associates. Only two nominees have had weaker public support: Harriet Miers, who withdrew her nomination, in 2005; and Robert Bork, rejected by the Senate in 1987. (Ted S. Warren/AP) Demonstrators hold signs, July 10, 2018, as they listen to a speaker during a protest in Seattle against President Donald Trump and his choice of federal appeals Judge Brett Kavanaugh as his second nominee to the Supreme Court. In 2005, 42 percent of Americans said the Supreme Court should make it harder to get an abortion while just 11 percent said it should make it easier. Today, 30 percent say the court should make it harder – down 12 points – and 21 percent say it should make it easier, up 10. Forty-five percent favor no change, the same now as then. 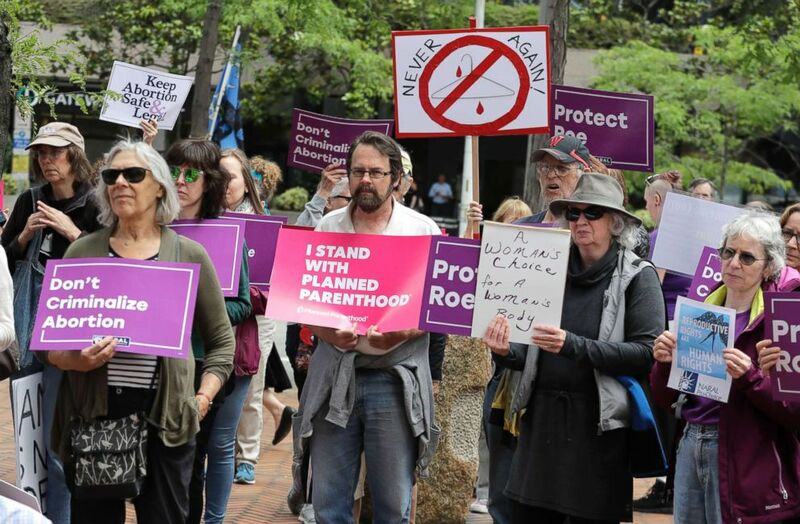 The drop in the view that the court should restrict abortion access is especially steep in several groups – down 16 points among women and Democrats alike, 18 points among moderates, 19 points among white Catholics and 20 points among liberals. There’s virtually no change, by comparison, among Republicans, conservatives and white Protestants, evangelical or not. Still, and perhaps surprisingly, there’s less-than-sweeping support for a tougher approach to abortion even among traditionally anti-abortion groups. Fifty-eight percent of evangelical white Protestants say the high court should make it harder to get an abortion; it’s about the same among conservatives and Republicans alike. By contrast, just three in 10 non-evangelical white Protestants, or white Catholics, agree. On the other side of the issue, thinking the court should make it easier to get an abortion is up by 23 points among liberals, 21 points among young adults, 15 points among Democrats and 14 points among women. Views of Kavanaugh are tightly tied to views of Donald Trump – unhelpfully for the nominee, given Trump’s poor job approval rating, 36-60 percent, approve-disapprove. Among Trump approvers, 73 percent say Kavanaugh should be confirmed; most of the rest have no opinion, rather than being opposed. Among those who disapprove of Trump, only 17 percent favor confirmation. Kavanaugh, similarly, is supported by 78 percent of Republicans, but this falls sharply to 35 percent of independents and 13 percent of Democrats. Sixty-eight percent of conservatives back his confirmation, vs. 32 percent of moderates and 10 percent of liberals. 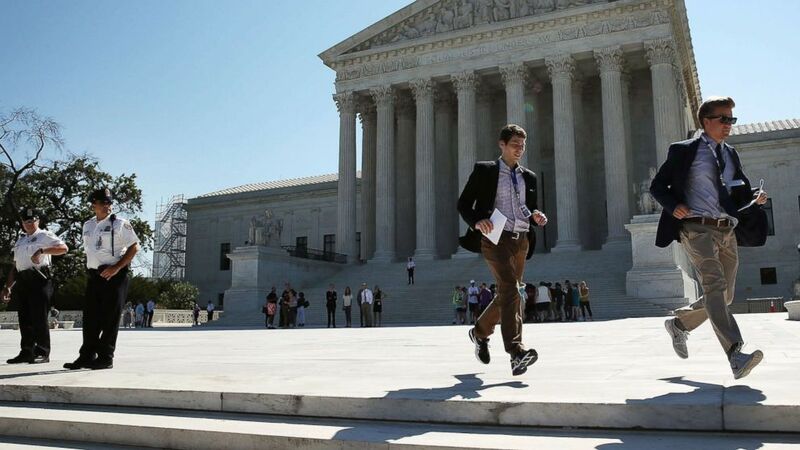 (Mark Wilson/Getty Images) Two CBS interns run with a newly released Supreme Court ruling June 20, 2016 in Washington. Other than Kavanaugh and Bork, all previous Supreme Court nominees have received more support than opposition in polls dating to Bork in 1987. That includes Trump’s first nominee, Neil Gorsuch, shortly after Trump took office last year. Preference that Kavanaugh should publicly state his position on abortion is more typical; 59 percent say so now, as did 54 percent at the time of Elena Kagan’s nomination in 2010 and as many as 64 percent when John Roberts was nominated in 2005. It was 73 percent when asked generically in 2003. This ABC News/Washington Post poll was conducted by landline and cellular telephone August 26-29, 2018, in English and Spanish, among a random national sample of 1,003 adults. Results have a margin of sampling error of 3.6 points, including the design effect. Partisan divisions are 33-25-37 percent, Democrats-Republicans-independents.